Cardiovascular & Antioxidant Support for energy, metabolism and boosting your immune system. Resveratrol is a powerful antioxidant found in the skin of red grapes that is 50 times stronger than vitamin C. It has long been the focal point of revolutionary anti-aging research. Harvard studies show that Resveratrol may reduce the risk of Alzheimers and Heart Disease. Harvard studies show that Resveratrol may reduce the risk of Alzheimers and Heart Disease. Resveratrol has also been proven to prevent breast cancer caused by estrogen in test-tube studies. Resveratrol may also counter the effects of a high-fat diet, meaning that it may be possible to eat more food, while not gaining extra weight, as believed with the European diet ("French Paradox"). Resveratrol is often touted as the ultimate fountain of youth. Scientific laboratory experiments confirm these claims and establish resveratrol as having the potential to increase longevity and improve health owing to the unusual antioxidant properties of the substance. 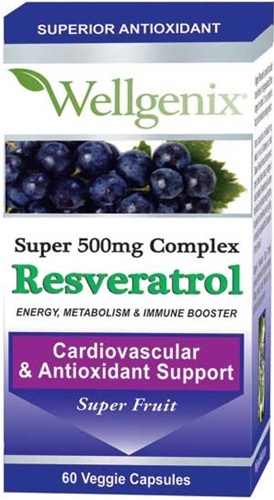 Wellgenix Resveratrol Super Complex provides all the benefits of highly-concentrated 500mg premium grade Resveratrol, plus other anti-aging ingredients. WARNING. If you are taking any medications or planning any medical procedure, consult your doctor before use. Discontinue use and consult your doctor if any adverse reactions occur. Store in a cool, dry place. Do not use if seal under cap is broken or missing.